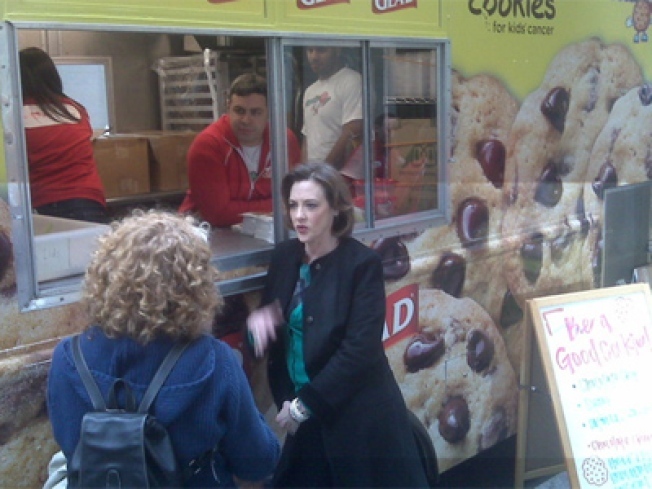 Joan Cusack serves you goodies from Cupcake Stop. Is it Christmas already? Joan Cusack: Working the Cupcake Stop truck as we type. What’s adorable and pink and small and makes you believe in rainbows and unicorns? Cupcakes. Also: Joan Cusack, sister of John, and possibly the most likeable person in show business, or at least high up on that list, somewhere near Ellen Degeneres. SO! News that Cusack will be working the Cupcake Stop truck all day long today – she’ll be dishing out goodies in return for donations to Cookies for Kids’ Cancer, according to Grub Street – well, it makes us like her AND cupcakes AND food trucks all the more. Cockles: Warmed! The truck will park it at Rockefeller Center, Bryant Park, in Times Square and near Grand Central Station – check the exact schedule here.